DISCUSS THE MATCH The Black Stars departed Accra Friday morning for their crucial World Cup qualifier against The Stallions of Burkina Faso in Ouagadougo for the Saturday clash but head coach, Mariano Barreto remains very cautious. The Portuguese coach left with a 20-man squad dominated by Ghana's foreign legion that includes captain Stephen Appiah, Samuel Osei Kuffour, Michael Essien, Richard Kingston, John Mensah, Emmanuel Duah, Derek Boateng, Emmanuel Osei, Addoquaye Pappoe, Sulley Muntari and Ibrahim Tanko as the foreign-based players on board. The local component that coach Barreto would be choosing from are Charles Taylor, Nana Arhin Duah, Sammy Adjei, Dan Coleman, Dan Quaye, Hamza Mohammed, Ablade Morgan, Amankwah Mireku and Abubakar Yahuza. Missing from the Black Stars squad are Ishmael Addo, Asamoah Gyan, Lawrence Aidoo, gk Louis Quainoo and Christian Atta Gyan have all been dropped ahead of Saturday's crucial game. Barreto says though their prime focus on Saturday will centre on picking the relevant point to keep their dream of qualifying from the Group alive, the homesters are favoured for the sort of exposure gained in the last few weeks. The Portuguese Coach told the GNA Sports that "three days is too short a time to do any serious preparation, but we will do our best and play to win". "My emphasis has always been to win and nothing else, we will play to win, because it is the only way we can keep our hopes alive". "I'm not a magician, but only a coach who can only wish for the best. We will try to win, but if we don't, at least we will know we tried", he added. He continued that "I know we will be losing some points along the way, but it must be as minimum as possible and that is why we will go there to fight all afternoon to achieve the needed success". The coach said he was, however, expecting a good show from the Stephen Appiah-led team if the corporation received so far among the players is anything to go by. "I'm hoping we will be at our best, both the local and the foreign-based players are co-existing very well, and that remains my inspiration". The Stars will play as guest of the Burkinabe's on Saturday in the opener of the 2006 World Cup qualifier. The Ghanaians are housed in a group, which include Burkina Faso, Cape Verde, The Democratic Republic of Congo, Uganda and South Africa. 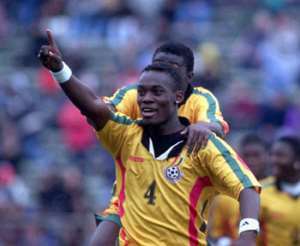 The last time the two countries met, it was the striking prowess of Isaac Boakye, which ensured a 2-1 victory for Ghana in the 2002 Africa Cup of Nations, which was hosted by Mali. The striker who came on as a substitute struck twice within five minutes deep into injury time to set the stage of a thrilling quarter final clash against the Super Eagles of Nigeria after the Stallions had taken an early lead in the last group game.